Blueberry is a shrub in the heather family (Ericaceae), which also includes cranberries, azaleas and rhododendrons. Blueberries grow all over the world, but they are native to North America. Native people dried them in the sun and stored them for use year-round. Blueberries are big business in North America, with major growing regions in Maine, Michigan, New Jersey, Nova Scotia, Quebec, and British Columbia. The health benefits of blueberries come from a class of antioxidants called anthocyanins: these are the deep blue-purple pigments the plant produces to attract birds and insects. The anthocyanins are thought to pass through the blood-brain barrier to improve the health of the brain—memory in particular. 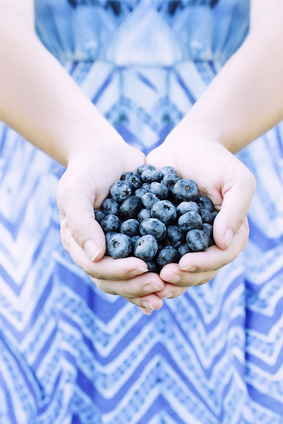 The antioxidant benefit from blueberries seems to be DNA-dependent. Recent research has shown the effectiveness of these berries is much greater with some people than others with respect to how they might protect the heart and brain. Blueberries have also been shown to have anti-inflammatory effects, and they have the potential to lower blood sugar levels.